Uppers have cut-outs and a snip toe. Overall very good. Shows signs of use. These are older shoes with plenty of life left. Pics show condition. 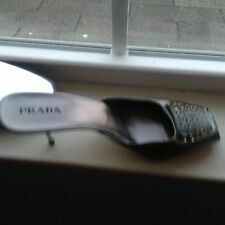 Rare silver bottom Prada mules gorgeous detail toe box and lucite heel. never worn. Wear along top edges of heels. Light wear on insoles. Celebrityowned cares about YOU! Rinaldi women's mules pumps size 38.5 ER. White / Beige with colored stones. - made in Italy measures: length 10" widest 3" heel height 2.5"
Heel is approx 4 5/8" tall. COLOR: Gold. Materials: Satin - Leather sole and lining. Size: Italy 38.5, US 8.5. Country of Manufacture: Italy. Style: Mules. Toe Style: Pointed Toe. Fashion Sneakers. Heel Height: 4. Heel Type: Stiletto. Material: Leather. These shoes typically show a little more wear in their soles and may have blemishes such as scuffs and/ or wrinkles. Condition is New with box. A l l g o o d q u a l i t y leather. Material: Genuine nappa leather upper. Color: Bright White. Size: US 9.5 EU 39.5 26.5 cm. This item is Genuine and authentic. have been tried on. Cute Mule used for display. STYLE: BONEE. • LENGTH: 8" FROM HEEL TO TOE ON THE OUTSIDE SOLE BOTTOM WITH THE BACK OF THE SHOE PRESSED AGAINST THE WALL. WOOD PLATFORM SOLES. LT BLUE LEATHER UPPERS. WOOD SPIKE HEELS. HARD, SHAPED, wood MATERIAL. Christian Dior DIORISSIMO MULE. Tan Dior Print with Burgundy Leather Trim DIOR NICKEL Finish. Dress up your new season look with a pair of ultra-modern shoes from Christian Dior. These shoes are gorgeous and they are very fashionable. Stuart Weitzman. Ivory Leather with Wood base 7 1/2 M. Wood base and heels. Ivory/ beige. : Patent Leather Upper/ Wooded sole & heels. You will be getting the pair of shoes you see in the picture. Condition is Pre-owned. These are like one of a kind show stoppers. They are very dainty and you can wear in casual or dressy setting depends how you pair it with dress. Great with a little black dress. Brand new in box. Women size 7N. Retails for $150. LEATHER: black and white flower details. FIT LIKE A SIZE 5 . Pointy Toe accented with Strap and Buckle across Top. Genuine Leather Uppers. Shoes are in good preowned condition. See pictures for description. Pet and smoke-free environment. THE SANDALS/ MULE ARE IN PRISTINE CONDITION. G-Series D17265 Metallic Gold Purple Stud Mule Heel Women's US 9B Worn Once ! Worn once for a few hours !G-Series D17265 Metallic Gold Purple Stud Mule Heel Women's US 9B, in box .Condition is Pre-owned. Shipped with USPS Priority Mail. Made in Italy. These open-toe, open-heel mules boast a textured, double-layered design combining an intricate, laser-cut matte leather over a ivory suede. make Supersized seem small. ~Upper 100% Natural leather. The insole is 9.5". Runs small; order next size up. Leather upper, lining and sole. Heel style: stiletto. Toe style: pointy toe, closed toe.